Anyone who watches crime shows knows one of the best ways to catch a criminal is with DNA. Pull a little of it from some blood left behind at the crime scene, compare it to a database and voila, criminal caught. Sometimes, though, there isn’t enough DNA or it has degraded so much you can’t get much out of it. Now you’re stuck. Or are you? A new study in PLOS ONE shows how you just might be able to save your case. As long as the criminal left a bit of hair behind that is. Usually hair doesn’t have enough DNA to work with. The researchers in this study get around this by backtracking from the hair to the DNA. They figure out what the criminal’s DNA should look like based on the hair sample. Unfortunately, at least for now, this technique is not nearly as powerful as standard DNA testing. If the data from the hair didn’t match your suspect, then you probably nabbed the wrong guy. But if the hair did match you couldn’t say that a particular suspect did it. Many people will have a similar pattern in their hair. This does not mean that this kind of analysis can’t be useful. Ruling out someone as a suspect is important (especially to that suspect!). And you can increase the power of a test like this by adding a bit of DNA that can easily be found in hair—mitochondrial DNA (mtDNA). Like this new test, mtDNA isn’t as powerful as our other DNA. Many people will share the same mtDNA. 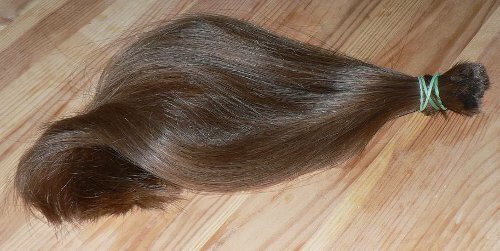 But many fewer people will probably share both the same hair and the same mtDNA. Finally, this is still a test in its infancy. With a few tweaks and a technological breakthrough or two, these researchers may be able to make this a more discriminating test. And so, perhaps, give DNA a run for its money. When you look at a Porsche, you assume it came out of a Porsche factory. You probably don’t think it came out of a GM or Ford plant. In other words, you can rule out a bunch of different factories and narrow down to a subset of all Porsche factories. Hair is similar. You can work backwards from the hair to what DNA it probably came from. But you can’t trace it back to the exact person. See, DNA has the instructions for making everything about you including your hair. So just like we can tell a Porsche came from a Porsche factory, we can tell your hair came from a certain set of DNA instructions. But, again, even though your hair is unique to you, we can’t tell it came from you in particular. All we can do is say it came from someone like you. Of course this means if it doesn’t match you, it isn’t your hair. That Jeep Cherokee did not come from that Porsche factory. The researchers in this study show that by just using hair, they can narrow possible suspects down to around 1 in 12,000 people. In other words, about one out of every 12,000 people will match that hair sample. Which means that a whole lot of people won’t! This is nothing like getting a hold of someone’s actual instructions, their DNA. A simple test can, assuming possible suspects aren’t related, easily get up to numbers like 1 in 2 million and often get to 1 in a billion or more. And if you look at more of the DNA, you can uniquely identify who had that DNA. Like a VIN tracing a car back to a specific factory. Still, if all you have is hair, this new test can at least give you some idea if you are at least barking up the right tree. Now of course your hair doesn’t have a Porsche logo on it. But because we understand the language of our DNA, the genetic code, we can backtrack from the hair to the original DNA. Well, at least a bit of probable DNA. Our DNA has the instructions for making each of us but it is not us. Any more than the instructions for making that Porsche is the same as having the car itself. DNA has the instructions for all of the parts that make us up. Most of these parts go by the name of proteins. For example, your DNA has the instructions for making the protein hemoglobin. It is that protein and not its DNA instructions that carry oxygen to and carbon dioxide away from your cells. Our hair is no different. It is actually made of lots of different proteins and has many proteins associated with it. And as a quick look at two random people shows, we don’t all have the same hair. Which means the proteins that make up the hair are a bit different. Getting from the proteins in our hair back to our DNA relies on our knowledge of the genetic code. This is the language our instructions are written in. 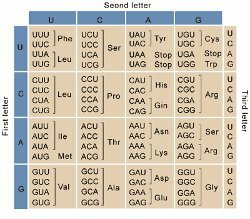 The genetic code has a simple alphabet made of just four letters, A, T, C, and G. And it has only 64 three letter words. That is enough to code for all life on Earth. Turns out that it isn’t even that complex. Those 64 words really have only around 21 different meanings. There are a lot of synonyms in the genetic code. So a gene, the bit of DNA that has the set of instructions for a particular protein, is really just a long sentence of three letter words. To understand how they get from hair protein to DNA, we need one more bit of information. What each of those three letter words actually means. A clue is in the fact that a protein is a long string of twenty different simple chemicals called amino acids. Turns out the three letter words each stand for a different amino acid. For example, the three letter “word” or codon ATG means put a methionine (Met) into a protein. Any time a cell sees an ATG in a gene, it puts in a Met. Let’s say that these researchers get a readout of someone’s hair protein and find a Met at the 53rd position in the protein. They know from this that the DNA has an ATG at this position in their gene. If they read someone else’s protein and instead find an alanine (Ala), then they know this person doesn’t have an ATG there. But here is where things can get fuzzy because of those synonyms. Turns out there are four different codons that mean Ala—GCC, GCT, GCA, and GCG. You can’t be sure which of these words is in the person’s gene for this protein. This isn’t the only issue with going from hair proteins to DNA. Another is that “reading” proteins isn’t as easy as reading DNA. This means that they have to use only well-known genetic differences which limits what they can read. Perhaps one day the technology for reading proteins will be as good as reading DNA. The we can get closer to having hair’s VIN instead of just knowing its make.